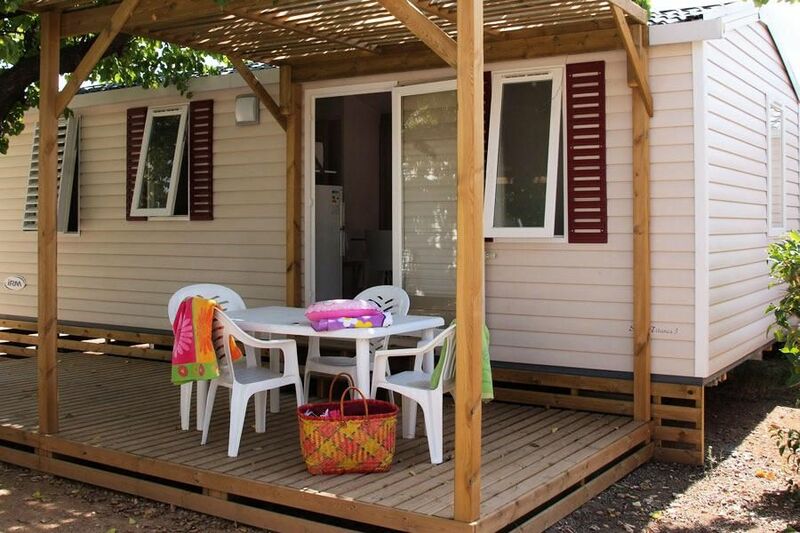 Mobile Home 4 rooms 6 people of 31m ² air-conditioned, composed of a corner living room, a corner cooks equipped, a room with a double bed (140x190), of 2 rooms with 1 bed simple and 1 bed trundle each (70x190 ), a shower room, separate WC and a semi-covered terrace. The Mobil Home includes a lounge area with TV, a kitchen area equipped with fridge-freezer, microwave, capsule coffee maker, cooking utensils and crockery adapted to the number of people in the accommodation. The terrace has a garden furniture. Bed linen: (disposable sheets): 9 € / single bed and 15 € / double bed. Towels: 8 € / kit 1 towel + washcloth. Take the A7 / A51 towards Aix en Provence then the A8 towards Nice. Take exit 36 direction St Tropez and continue on the N555 to Le Muy.